As of April 25, 2019 2:12 PM ET Minimum 20 minute delay. CHATTANOOGA, Tenn.--(BUSINESS WIRE)-- More than half of parents (56 percent) believe a child should first visit the dentist after age 2, though dental professionals recommend a visit when a baby’s first tooth emerges, or by age 1, according to recent research from employee benefits provider Unum (NYSE: UNM). Additionally, 36 percent of parents think young children (ages 3 to 12) should visit the dentist once a year at most, but dentists recommend a bi-annual check-up. 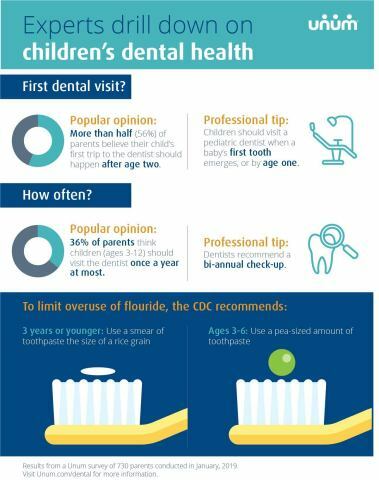 These findings and others were part of a recent Unum survey of 730 parents during the American Dental Association’s National Children’s Dental Health Month. According to the Unum study, most parents (90 percent) were on track in believing children should brush their teeth at least twice a day, but recent research from the Centers for Disease Control and Prevention indicates parents may be overdoing it on the amount of toothpaste their little ones are using. Toothpaste contains fluoride, which prevents cavities, but if young children ingest too much, it can discolor and pit permanent teeth. The CDC recommends children younger than 3 years old use an amount the size of a rice grain, and children ages 3 to 6 years old use a pea-sized amount. Unum added dental coverage to the company’s comprehensive portfolio of workplace benefits in 2017. Unum dental plans include a national network of more than 109,000 dentists and specialists at 400,000 access points nationwide, flexible plan designs and digital tools, including a mobile app and dental cost estimator, to help ease the costs of oral care. Unum Group (www.unum.com) is a leading provider of financial protection benefits in the United States and the United Kingdom. Its businesses include Unum US, Colonial Life, and Unum UK and Unum Poland. Unum’s portfolio includes disability, life, accident and critical illness, dental and vision coverage, which help protect millions of working people and their families in the event of an illness or injury. Unum also provides stop-loss coverage to help self-insured employers protect against unanticipated medical costs. The company reported revenues of $11.6 billion in 2018 and provided nearly $7 billion in benefits.